Nitrogen is the most commonly limiting nutrient in barley production. The deficiency manifests as an overall yellowing of the leaves. Nitrogen is mobile in the plant, so symptoms will begin with the older leaves while the younger leaves may appear healthy. Nitrogen-deficient plants are smaller and have fewer tillers [N28, N44]. Nitrogen deficient barley plants. Older leaves die and form a thatch of dry leaves around the base of the plants (photo provided by the International Plant Nutrition Institute). Excessive N increases lodging, delays maturity, increases severity of some diseases, pollutes groundwater, and causes rainfed barley to deplete moisture too early in the season [N5, N10, N28]. Excessive N applications can also increase grain protein content and reduce plump kernel percentage of malting barleys to unacceptable levels [N27,N32]. Residual soil nitrate and irrigation water nitrate contribute to barley's N requirement. These tests are especially important for fertilizing malt barley, as excess N fertilization may increase grain protein content to a level which reduces marketability [N34]. The residual soil nitrate level depends on a number of factors related to soil properties, weather and crop management (see Factors Affecting Soil Nitrate-N). Therefore, the test needs to be carried out every year. Sampling should be taken close to planting or in spring before the first topdress N application. Due to the variability of nitrate in the soil, care must be taken to assure that the sample is representative for the field (see Sampling Instructions). Although barley roots may be 5 feet deep in the absence of limiting layers [N20, N45], soil is generally sampled to a depth of two feet, in one-foot increments [N5, N11, N16]. Pounds of nitrate-N potentially available per acre in each foot of soil can be estimated by multiplying parts per million of nitrate-N by 4 [N5]. For example, a nitrate-N concentration of 10 ppm in the top foot of the profile corresponds to 40 lbs N/acre. When well water is used for irrigation, a considerable amount of N may be applied with the irrigation water. To convert nitrate-N concentration in the water to lbs N/acre, ppm nitrate-N in the water is multiplied by 0.226 and by the number of acre-inches of water applied [N11]. For example, with 1 acre-inch of water containing 10 ppm nitrate-N, 2.26 lbs N are applied per acre. 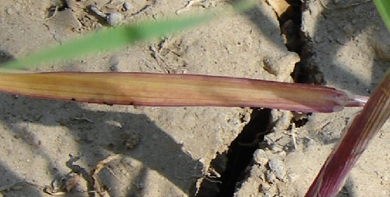 The nutrient status of barley can be determined by analyzing leaves or stems. 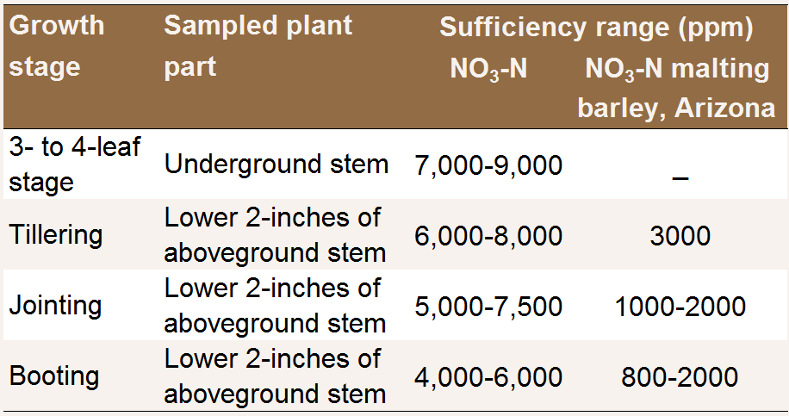 For wheat, stem nitrate-N concentrations were found to vary more between sites than total plant N [N21]. Due to such site-specific differences, N fertilization decisions should not be based on plant analyses alone. For a representative sample, the top four leaves from 50 to 100 randomly selected plants should be sampled [N22]. Fresh tissue samples should be placed in open, clean paper bags. The samples may be partially air-dried or kept cool during shipment to the laboratory [N22]. Leaf analysis guidelines for barley [N8]. Malting barley may use somewhat lower values [N31, N39]. To take a representative tissue sample, collect 20-40 stems from random plants . Cut off the roots and plant tops, taking care that no soil or leaves contaminate the sample. Send the bottom 1-2 inches of the stems to the lab for analysis on the day that they are collected [N28]. Wheat and barley are generally considered to have the same critical levels; however, research in Arizona suggests that lower levels may be appropriate for irrigated malting barley [N31, N39]. Stem analysis guidelines for barley [N8, N31, N39]. The amount of N required by barley is often estimated by multiplying the bushels of expected yield by a factor determined in field trials. Little research has been done in California to determine yield-based recommendations. Recommendations based on field trials in Arizona [N30, N31], Western Oregon and Washington [N4, N16, N17, N41], the Great Plains [N18], Colorado [N11] and Idaho [N5, N38] yield an average recommendation of 1.2-1.5 lbs available N per bushel (50-63 lbs N/ton) of expected yield for malting barley and 1.7-2.0 lbs available N per bushel (70 - 83 lbs N/ton) for feed barley. Residual soil nitrate or nitrate in the irrigation water is subtracted (see Soil Testing). If straw or corn stubble was returned to soil directly before barley, an extra 10-15 lbs N/ ton of residue is recommended, to assist with breakdown [N5, N31]. If barley follows a legume like peas or beans, a reduction of 30-40 lbs N/acre can be made. For California rainfed small grains, Munier and coworkers [N28] recommend as little as 10-20 lbs N/acre (applied at sowing) for a crop following a legume fallow. If barley follows alfalfa a reduction of about 60 lbs N /acre is commonly recommended, depending on stand density [N5, N11, N16, N18]. Soil N which may potentially be released from organic matter is often ignored as California soils tend to be low in organic matter [N29]. Malting barley growers on higher organic matter soils, such as those around the Tulelake Basin [N34] should consult their local farm farm advisor. Optimal barley yields in California have been obtained with N fertilizer application rates of 50-120 lbs N/acre [N28]. While high yields are produced with 50-80 lbs N/acre in the Intermountain area, 120-150 lbs N/acre are generally applied in the San Joaquin Valley to achieve top yields (R. Wilson and S. Wright, personal communication). Splitting applications generally increases N use efficiency and allows rainfed barley growers to adjust total rates in drier years when yield is lower than expected [N7]. In California, split applications are especially recommended for barley grown on soils with claypans or hardpans, soils prone to waterlogging, and shallow or coarse-textured soils [N28]. Barley planted in late fall takes up little N until late January or early February [N28]. In general, barley plants generally take up less than 50 lbs/acre before stem elongation (jointing stage) takes place [N12]. However, since tillers and heads are formed in early growth stages, early-season deficiencies will strongly affect yield [N2, N28]. It is necessary to provide sufficient N for early growth while avoiding excess application that could lead to leaching losses with winter rains, lodging and increase the risk of freeze damage [N1, N2]. No preplant fertilizer is advised for irrigated barley in many states; rather, a starter application of 15-30 lbs N/ha is recommended, with the rest of the requirement applied in spring [N1, N5, N27, N31, N46]. For California, Munier and coworkers [N28] recommend that 1/2 to 2/3 of the total N requirement be applied at sowing and the remainder as topdress, with half applied at sowing for very sandy or gravelly soils. In fields with a history of manure and lagoon water applications, the barley crop probably has sufficient N until early spring and preplant and starter applications are not necessary [N28]. Preplant fertilizers may be broadcast, injected, banded or placed in irrigation water [N28]. Dry fertilizer, especially urea, needs to be incorporated or watered in as soon as possible to avoid volatilization losses [N23]. Subsurface banding is best if soil nitrate levels are low or volatilization potentials are high; i.e. high pH or soils with crop residues on the surface [N23, N27]. Anhydrous ammonium and aqua ammonia must be injected 6 to 8 inches deep in loamy soils and 8-10 inches deep in sandy soils to avoid losses of gaseous ammonia [N3, N37]. When properly managed, no quality or yield differences have been observed between different fertilizers [N27]. Fertilizer choice depends on the weather (current and forecast), and fertilizer costs [N28]. Urea is inexpensive, high analysis and nitrifies less quickly than ammonium fertilizers. However, ammonium and especially urea-based fertilizers are prone to volatilization and should only be applied if they can be incorporated or if a rain or irrigation event of at least 1/2 inch is expected within a few days after application [N23, N28]. Urease inhibitors and slow-release coatings may reduce N losses from fall-applied urea and increase N use efficiency [N27]. They should, however, be avoided for rainfed barley because their rate of release depends on soil moisture and temperature and they risk providing insufficient N at times of peak uptake and supplying too much late in the season when N availability can increase malting barley protein to unacceptable levels [N27]. In shallow or coarse soils, nitrate-based fertilizers are not recommended because of their leaching potential [N27]. Nitrogen applied in fall is prone to leaching with winter rains. Therefore, preplant N applications to barley are best done as close to sowing as possible, to reduce the time between application and plant uptake. This is especially important under conservation tillage and when there are other residues in the field whose decomposition may compete with barley for soil N [N15, N25]. No more than 30 lbs N+K2O should be applied directly with the seed to avoid seedling injury [N31, N33]. Before stem elongation (jointing stage) takes place, barley plants generally take up less than 50 lbs/acre [N12]. When the total N requirements until spring are not met by the starter fertilizer and the residual soil nitrate, the difference should be applied preplant. Trials on rainfed wheat in Oregon and Washington have showed that subsurface banding is more efficient than broadcasting, particularly for spring grains [N33, N42, N43]. A band 2 inches below and to the side of the seed is generally recommended, although in coarse-textured soils the distance may be increased [N43]. No-till grains may especially benefit from deep banding, because it reduces the weed competition and residue tie-up associated with surface broadcasting [N43]. Broadcast urea is also more in danger of volatilizing where residues are on the surface, because they limit urea's contact with soil [N23]. Small grains are tolerant of close placement, except when soils are dry at seeding time [N41]. In moist soils P and small amounts of N and K can be drilled with the seed [N24]; this is an efficient means in very cold, wet soils where root development is likely to be limited. Banding of starter N and P together has been shown to increase plant P uptake [N35]. A low N, high P fertilizer such as monoammonium phosphate (MAP) is recommended. Urea, anhydrous ammonia, ammonium thiosulfate and diammonium phosphate (DAP) can be used, but should not be placed with the seed because these materials may release free ammonia which is toxic to young seedling roots [N18, N19, N33, N36]. In California, Munier and coworkers [N28] recommend that 1/2 to 2/3 of the total N requirement be applied at sowing and the remainder as topdress, with half applied at sowing for very sandy or gravelly soils. One or two applications of 30-50 lbs N/acre are recommended, depending on the winter rainfall and N status of the plants [N28]. To minimize volatilization losses, broadcast urea and ammonium applications should be timed so that they are followed within 1-2 days by irrigation or a rainfall event of at least 0.5 inches within a few days [N23, N28]. Soil moisture should also be taken into account as applications to very dry soil can decrease yields, possibly by damaging seedling roots [N15]. Liquid N fertilizer may also be injected into sprinkler systems and applied with the irrigation water. However, topdress applications of liquid fertilizer to established barley should be less than 40 lbs N/acre to prevent leaf burn [N27]. When well-managed and when there are no severe deficiencies, different fertilizer types do not differ in their effects on grain yield or quality [N27]. The choice of fertilizer depends on the current and forecasted weather conditions, the urgency of the deficiency and fertilizer costs. Urea (46-0- 0) is inexpensive, high analysis, and is commonly used if it can be washed into the soil within a few days by irrigation or rainfall [N28]. If the crop is severely N-deficient fertilizers containing nitrate such as UAN or ammonium nitrate are recommended, because nitrate moves easily in soil, is less likely than ammonium to be immobilized and is immediately available to plant roots after the first irrigation [N28, N31]. Ammonium sulfate may be a good choice if sulfur is also required, but it is more expensive than urea [N28]. In California, little N uptake occurs in winter if the crop is sown in late fall and has not grown much before the cold weather. Uptake starts to occur in late January and early February, rises through the spring, and starts to decrease after heading [N28, N31]. Nitrogen uptake is highest during stem elongation stage, which is also the time when heads are formed [N1, N46]. Thus, N applications made during the tillering stage, as long as they are followed by rain or irrigation, are the most effective for achieving high grain yields [N2]. Applications at the booting stage are less effective, and at heading or later will have little effect on grain yield [N28]. Late applications at booting or later may also increase the risk of lodging (S. Wright, personal communication). Furthermore, growers of malting barley should use late applications with caution, as they may increase the protein concentration and decrease kernel plumpness [N7]. Response to foliar N may be quicker than to water- or soil-applied N [N13], but it is more expensive and may damage the leaves if applied at rates greater than 10-20 lbs N/acre [N31]. Foote and Batchelder [N15] found that soil topdressed ammonium nitrate gave higher yields than equivalent rates of foliar-sprayed urea on rainfed spring barley in Oregon. A study on rainfed spring barley in the Willamette Valley found urea sprays to 6-inch tall barley to be more effective for increasing yields than sprays at 12 inches or early heading [N15]. Risk of leaf burn may also be lower when foliar applications are made earlier in the year, while temperatures are cooler [N23]. Foliar N sprays after anthesis can increase grain protein [N9, N41]. However, when soil N availability is sufficient, foliar applications may have little effect on protein concentration [N6]. Midday applications are more likely to result in leaf burn than applications made in the early morning or late afternoon; however, leaf burn is also associated with applications made while the dew is still on the crop [N13]. Any water-soluble fertilizer may be used but the rates will vary. Urea is a common choice, since it is rapidly and efficiently absorbed and is less likely to cause leaf burn than ammonium sulfate or ammonium nitrate [N13, N14]. Urea-ammonium nitrate (UAN) is also effective [N41]. Malakondaiah and coworkers [N26] reported the best results from a 1.5%-2.2% urea solution. Phosphorus is especially important for seedling vigor, root development and early-season growth. It also has a regulating role in tillering [P15]. Commonly the only early symptoms are stunting, slow early growth and a lack of tillering, making P deficiencies difficult to see [P4, P15]. Sometimes purpling is observed, starting on the older leaves and advancing to younger as the deficiency becomes severe [P25]. Phosphorus deficiencies are most likely in conditions of slow root development, such as very cold or waterlogged soils. In California barley production, P deficiency is most common on shallow uplands, i.e., terrace and foothill soils [P15], and following rice [P2]. 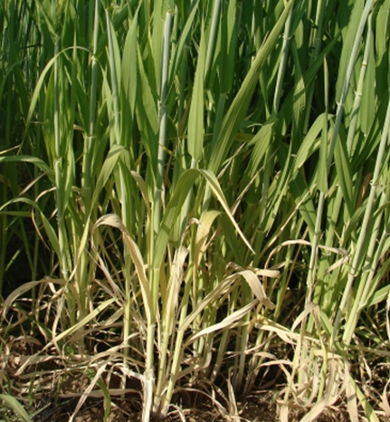 Under severe P deficiency, purple leaves turn dark yellow to orange red (photo provided by the International Plant Nutrition Institute). Soil samples are generally taken in fall or spring from the top foot of the profile where root density is highest [P18]. However, barley can access nutrients and water below the top foot of the profile. While the root density is highest in the top two feet of the profile, some roots may reach to a depth of 5 feet [P10, P26] . A total of 15-20 cores should be taken from the field; a sufficient sample is especially important in fields where P has been banded previously [P6]. See Soil Test Sampling for sampling instructions. To make accurate P fertilization decisions, soil test values are best combined with tissue P concentrations and P budgets (see Preplant Application Rate). In California, the available soil P is generally determined on sodium bicarbonate extracts (Olsen-P test). This test should be limited to soils with a pH between 5.5 and 8.5 containing less than 3% of organic matter. For soil outside this range, water or calcium chloride extracts may be more reliable [P18]. For more information contact your local farm advisor. A yield response is likely if barley is grown on a soil with test P below 6 ppm and unlikely if it is greater than 15 ppm Olsen-P [P6, P15, P27]. Response on soils with values from 6-15 ppm is variable; positive responses seem to be associated with high yield potentials, late seeding dates and the presence of root diseases that limit plant growth [P27]. Tissue P values should be used to make site-specific assessments. 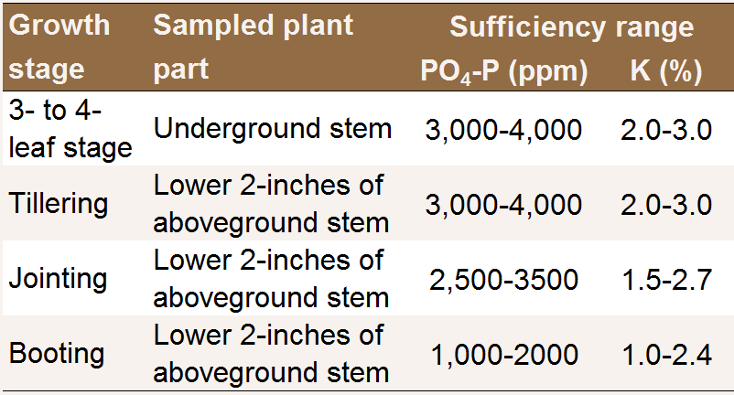 Interpretation of P and K soil test levels in the top foot of the soil profile [P15, P18]. Since P fertilizer can interact with free lime in the soil, Stark and Brown [P21] recommend using a critical value of 20 ppm if free lime exceeds 10%. In cold, wet conditions a response may be seen to seed-placed P even in soils with adequate P [P12]. Barley grown after rice usually responds to P fertilizer, even if the soil test suggests adequate P is available [P2]. The nutrient status of barley can be determined by analyzing leaves or stems. Site-specific factors may affect plant nutrient concentrations. For this reason, fertilization decisions should not be based on plant analyses alone. For a representative sample, the top four leaves from 50 to 100 randomly selected plants should be sampled [P11]. Fresh tissue samples should be placed in open, clean paper bags. The samples may be partially air-dried or kept cool during shipment to the laboratory [P11]. Leaf analysis guidelines for barley [P5]. For a representative sample, 20 to 40 stems should be collected at random from a field. The bottom 1 to 2 inches of each stem are used for analysis and the roots and plant tops are cut off. The sample should be sent to the lab the day it has been collected. For an accurate result, the sample needs to be free of soil and old leaves [P15]. Stem analysis guidelines for barley [P5]. To maintain P availability at an optimal level in the long term, the P removed at harvest may be replaced. Approximately 0.4-0.62 lbs P2O5 are taken off the field for each bushel of grain harvested. A ton of straw contains approximately 3-4.2 lbs P2O5 [P20, P22]. For example, if a barley field yields 80 bu of grains per acre (3840 lbs/acre) and the harvest index is 0.5, 32- 50 lbs P2O5 /acre are removed with the grains and 6-8 lbs/acre with the straw. Higher rates may be required for soils that test in the deficient range, particularly in acid or alkaline soils in which P is less available. In California, Munier and coworkers recommend adding 30-40 lbs P2O5/acre for irrigated barley, and 20-30 lbs for dryland [P15]. If using an ammonium-containing fertilizer such as MAP, no more than 25-30 lbs N/acre should be drilled with the seed. If P is broadcast rates should be doubled [P6, P8, P15, P16]. 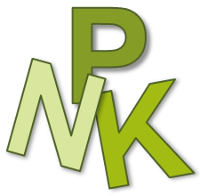 Rates may be higher in acid or alkaline soils, in which P is less available. The amount of fertilizer that can be band-applied safely at planting depends on its N and K content (see Starter N). If soil is P deficient and a heavy application of P fertilizer is needed to raise the general P level, broadcasting and incorporating P prior to seeding can be effective as long as the pH is neutral [P20]. Since P is immobile in soil, broadcast P should be incorporated before planting to ensure it goes into the root zone [P6]. Broadcasting P is not recommended on acid, alkaline or P-fixing soils [P3]. Banding is considered more efficient than broadcasting [P6, P8]. Bands should be 1.5 to 2 inches below and to the side of the seed for good root contact. Longer distances may be required for coarse-textured soils to avoid seedling injury when P is applied together with N [P24]. Uptake of P is improved if it is banded with N.
Starter fertilizer may also be drilled directly with the seed [P12, P15]. This is particularly recommended in cold, wet conditions in which both root growth and P diffusion in the soil are limited [P20] or in acid, alkaline and calcareous soils in which P is relatively unavailable [P15]. If an ammonium-containing fertilizer such as monoammonium phosphate (MAP) is used, no more than 25-30 lbs N per acre should be drilled with the seed [P15]. The presence of N in the fertilizer band improves P uptake, but too much N fertilizer may damage the seedling. Therefore low ammonium, high P fertilizers such as monoammonium phosphate (MAP) are recommended for starter fertilizers. MAP is preferable to diammonium phosphate (DAP), which has a higher salt index and gives off free ammonia, which is toxic to seedlings [P15, P20]. When barley is grown in the first year or two after flooded rice P is often deficient. Research by Brandon and Mikkelsen on California rice soils shows that MAP is more effectively used by barley grown after rice than triple superphosphate (TSP), probably due to the presence of ammonium in the fertilizer band [P2]. When smaller application rates are required, all P may be applied as a starter. When larger quantities are needed, it may be more practical to apply a small amount as a starter and broadcast the rest preplant. Preplant P fertilizer is best applied before a tillage operation when broadcast. However, the time of application is not as crucial as it is with N because P is immobile in the soil and does not leach. All P is normally applied prior to planting, as P deficiencies in early growth have the most serious consequences for yield [P9] and P is immobile in the soil and does not leach. Several studies have demonstrated increased yields after P foliar sprays to P-deficient barley [P1, P13, P17]. However, increases have not been found with sufficient soil P fertilization [P13, P23]. Too heavy an application of a given foliar P compound can cause leaf burn, which may reduce yields if it is severe [P7]. A general plant tolerance level of 4-6 lbs of MAP and DAP per 100 gal water and 3-5 lbs of phosphoric acid per 100 gal water is advised for repeated foliar sprays [P14]. Potassium is essential for barley growth and development, aiding in the development of strong roots and stem, decreased lodging and resistance to winter kill and root diseases [K16]. Deficiency symptoms begin on the older leaves, although the whole plant may be affected. Early symptoms include chlorotic leaf tips and margins. As deficiency becomes more severe necrosis appears as a speckling along the length of the leaf and spreads to the tips and margins. An "arrow" of green tissue remains from the base upward to the center of the leaf. The death of older leaves is common [K15, K16, K21]. 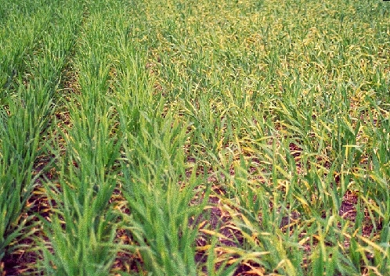 Severe K deficiency on a sandy soil in early spring (right). Barley on the left received a low amount of starter fertilizer (photo provided by the International Plant Nutrition Institute). 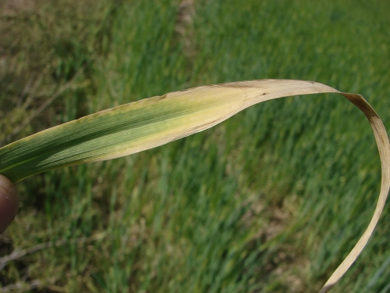 Leaf necrosis caused by severe K deficiency (photo provided by the International Plant Nutrition Institute). Soil samples are generally taken in fall or spring from the top foot of the profile where root density is highest [K17]. However, barley can access nutrients and water below the top foot of the profile. While the root density is highest in the top two feet of the profile, some roots may reach to a depth of 5 feet [K10, K22]. A total of 15-20 cores should be taken from the field; a sufficient sample is especially important in fields where P has been banded previously [K6]. See Soil Test Sampling for sampling instructions. To make accurate K fertilization decisions, soil test values are best combined with tissue K concentrations and K budgets (see Preplant Application Rate). Plant available K is determined by extracting the soil samples with an ammonium acetate solution [K17]. Yield responses to K are very rare in California and are expected only on the most deficient soils, with an ammonium acetate-extractable K of less than 60 ppm [K16]. In Washington and Oregon, on soils with low latent reserves of K a critical value of 100 ppm is used [N19]. Where soils are in the medium range, fertilizer may be added to replace K removed in harvest. If barley is grown in rotation with other crops that receive K, no fertilization may be necessary [K3]. Interpretation of P and K soil test levels in the top foot of the soil profile [K16, K17]. For a representative sample, the top four leaves from 50 to 100 randomly selected plants should be sampled [K12]. Fresh tissue samples should be placed in open, clean paper bags. The samples may be partially air-dried or kept cool during shipment to the laboratory [K12]. Leaf analysis guidelines for barley [K4]. For a representative sample, 20 to 40 stems should be collected at random from a field. The bottom 1 to 2 inches of each stem are used for analysis and the roots and plant tops are cut off. The sample should be sent to the lab the day it has been collected. For an accurate result, the sample needs to be free of soil and old leaves [K16]. Stem analysis guidelines for barley [K4]. In general, in California yield responses to K fertilization are unusual in small grains unless the soil is very deficient [K16]. To maintain K availability at an optimal level in the long term, the K removed at harvest may be replaced. Approximately 0.3-0.35 lbs K2O are taken off the field for each bushel of grain harvested. A ton of straw contains approximately 40 lbs K2O [K18, K19]. For example, if a barley field yields 80 bu of grains per acre (3840 lbs/acre) and the harvest index is 0.5, 24-28 lbs K2O/acre are removed with the grains and 75-80 lbs/acre with the straw. However, unless the soils are K deficient or fix K, K applications may not have economic benefits. Contact your local farm advisor for more information. Generally K is broadcast and incorporated prior to planting. Banding low rates of K as starter fertilizer at planting may increase yields [K13]; however, the benefit gained from banding is likely to be small in soils with medium and high soil test K.
Potassium is relatively immobile in the soil and needed in high amounts early in the growing season, so it is best to apply at or immediately prior to seeding. It is not usually topdressed [K14]. Potassium chloride (KCl), potassium sulfate (K2SO4), and potassium magnesium sulfate (K2SO4* 2MgSO4) are common K fertilizers. They all contain readily available K. Choice of fertilizer may be made based on price and whether the application of chloride, sulfate or magnesium is beneficial. Yield response to KCl applications has been seen even in high K-testing soils, due to the beneficial impact of chloride fertilization, which may decreased root rot incidence and spot blotch symptoms on the flag leaves [K8, K20]. Potassium is seldom included in a starter fertilizer. If a starter blend containing K is used, it needs to be applied with care, as K and ammonium may damage seedling roots. Even though barley is relatively salt tolerant the total N plus K2O should not exceed 30 lbs/acre, unless a wide opener is used [K14]. If larger rates of K are needed, they may either be broadcast prior to planting or banded at least one inch away [K14]. In K-fixing soils, such as occur on the east side of the San Joaquin valley, banding or placement with the seed is the most efficient way to apply K. For more information, see K Fixation in the San Joaquin Valley. Starter K may also be beneficial in cool, wet no-till soils even if soil test K is high, as soil K may be less available to the seed [K11]. Potassium is relatively immobile in the soil and can be applied at or immediately prior to seeding. It is not usually topdressed [K14]. On deep sandy soils with a high leaching potential, a split application may be considered, with half of the total rate applied prior to planting and half just before stem elongation [K5]. Increases in yield and disease resistance have been seen on K-deficient, sandy soils in Australia in response to K applications 8 weeks after seeding [K2]. Little research has been done to explore the effects of foliar K on barley. Potassium is required in much larger amounts than what can be applied with foliar fertilizers [K7]. Therefore, foliar K applications can at best supplement soil applied K, but not replace it. Some studies with wheat suggest that foliar K applications can reduce yield losses caused by salinity or drought [K1, K23]. Alley, M.H., Pridgen, T.H., Brann, D.E., Hammons, J.L., Mulford, R.L., 2009. Nitrogen Fertilization of Winter Barley: Principles and Recommendations. Virginia Cooperative Extension. Baethgen, W.E., Christianson, C.B., Lamothe, A.G., 1995. Nitrogen fertilizer effects on growth, grain yield and yield components of malting barley. Field Crops Research 43, 87-99. Brauen, S.E., Turner, D.O., Halvorson, A.R., 1976. Fertilizer guide: Spring wheat, barley and oats for western Washington. FG-48 (Rev). Washington State University. Brown,B., 2009. Irrigated Winter Barley. Idaho Nutrient Management, University of Idaho. Bulman, P., Zarkadas, C.G., Smith, D.L., 1994. Nitrogen fertilizer affects amino acid composition and quality of spring barley grain. Crop Science 34, 1341-1346. Castro, A., Petrie, S., Budde, A., Corey, A., Hayes, P., Kling, J., Rhinhart, K., 2008. Variety and N management effects on grain yield and quality of winter barley. Crop Management 7(1). Craig, S., Jones,B., 2011. Late nitrogen application to increase grain protein in barley. Birchip Cropping Group 2011 Season Research Results, 87-90. Crowe, F.J., Brevig, R., James, S.R., 1986. Effect of planting date, fertilizer rate, and seeding rate on spring barley performance. Davis, J.G., Westfall, D.G., 2009. Fertilizing spring-seeded small grains. Colorado State University. Delogu, G., Cattivelli,L., Pecchioni, N., De Falcis, D., Maggiore, T., Stanca, A.M., 1998. Uptake and agronomic efficiency of nitrogen in winter barley and winter wheat. European Journal of Agronomy 9, 11-20. Fernandez, V., Sotiropoulos, T., Brown, P., 2013. Foliar fertilization: scientific principles and field practices. International Fertilizer Industry Association. Foote, W.H., Batchelder, F.C., 1953. Effect of different rates and times of application of nitrogen fertilizers on the yield of Hannchen barley. Agronomy Journal 45, 532-535. Franzen, D.W., 2010. North Dakota fertilizer recommendation tables and equations. North Dakota State University Extension Service. Gerwing, J., Gelderman, R., 2005. Fertilizer Recommendations Guide. South Dakota State University Cooperative Extension Service. Grant, C.A., Bailey, L.D., 1999. Effect of seed-placed urea fertilizer and N-(n-butyl)thiophophoric triamide (NBPT) on emergence and grain yield of barley. Canadian Journal of Plant Science 79, 491-496. Gregory, P.J., Tennant, D., Belford, R.K., 1992. Root and shoot growth, and water and light use efficiency of barley and wheat crops grown on a shallow duplex soil in a Mediterranean-type environment. Australian Journal of Agricultural Research 43, 555-573. Hawe, W.P., Cassman, K.G., Fulton, A., Jackson, L.F., 1989. Evaluation of tissue nitrogen tests as a prognostic tool for irrigated wheat production. Journal of Fertilizer Issues 6, 89-99. Jones, C.A., Koenig, R.T., Ellsworth, J.W., Brown, B.D., Jackson, G.D., 2007. Extension Publication EB 173, Management of Urea Fertilizer to Minimize Volatilization. Montana State University. Kearney, T., Marsh, B., Wright, S., Jackson, L., 2006. Seedbed preparation, sowing and residue management. In: UC ANR (Ed.). Small Grain Production Manual. ANR Publication 8208. Krantz, B.A., Broadbent, F.E., Williams, W.A., Bahgott, K.G., Ingebretsen, K.H., Stanley, M.E., 1968. Research with nitrogen fertilizer emphasizes.. fertilize crop - not crop residue. California Agriculture 22, 6-8. McVay, K., Burrows, M., Jones, C., Wanner, K., Manalled, F., 2009. Extension Publication EB 0186 Montana Barley Production Guide. Montana State University. Orloff, S., Wright, S., Ottman, M., 2012. Nitrogen management impacts on wheat yield and protein. Proceedings of the 42nd California Alfalfa Forage Symposium, 2012. Ottman,M.J., 2011. Nitrogen fertilizer requirement of feed and malting barley compared to wheat, 2011. 2011 Forage & Grain Report, College of Agriculture and Life Sciences, University of Arizona. Ottman, M.J., Thompson,T., 2015. Fertilizing small grains in Arizona. University of Arizona factsheet AZ1346. Petrie, S., Hayes, P., Rhinhart, K., Blake, N., Kling, J., Corey, A., 2003. Fertilizer management for winter malting barley. Agricultural Experiment Station Oregon State University Special Report 1047. Petrie,S., 1987. Fertilizer placement for cereal root access. US Department of Agriculture Soil Conservation Service Technical Notes TN -Agronomy-48. Puri, Y.P., Baghott, K.G., Prato, J.D., 1977. Wheat and barley response to nitrogen. California Agriculture 31, 10-11. Sangakkara, U.R., Cho, C.M., 1987. Effect of NH4+ nitrogen on phosphorus uptake by canola, lentils, soybeans and wheat. Journal of Agronomy and Crop Science 159, 199-201. Saskatchewan Ministry of Agriculture, 2012. Guidelines for safe rates of fertilizer placed with the seed. Thompson, T.L., Ottman, M.J., Riley-Saxton, E., 2004. Basal stem nitrate tests for irrigated malting barley. Agronomy Journal 96, 516-524. Turley, R.H., Ching, T.M., 1986. Storage protein accumulation in 'Scio' barley seed as affected by late foliar applications of nitrogen. Crop Science 26,778-782. Veseth, R., McDole, R., Engle, C., Comocil, J., 1989. Fertilizer band location for cereal root access. In: Pacific Northwest Conservation Tillage Handbook. Weaver, J.E., 1926. Root Development of Field Crops. McGraw-Hill Book Company, Inc. New York. Weisz, R., Heiniger,R., 2013. Nitrogen management for small grains. In Weisz, R. (Ed.). Small Grain Production Guide. North Carolina State University. Benbella, M., Paulsen, G.M., 1998. Efficacy of treatments for delaying senescence of wheat leaves: II. Senescence and grain ield under field conditions. Agronomy Journal 90, 332-338. Brittan, K.L., 2003. 2003 Yolo / Solano / Sacramento wheat and barley production. Gardner, E.H., Jackson, T.L., Kronstad, W.E.,2000. Spring grains. Western Oregon: West of Cascades fertilizer guide. Oregon State University Extension Service. Grant, C.A., Flaten, D.N., Tomasiewicz, D.J., Sheppard, S.C., 2000. The importance of early season phosphorus nutrition. Canadian Journal of Plant Science 81, 211-224. Jones, C., Jacobsen, J., 2009. Fertilizer Placement and Timing. Montana State University Extension 4449-11. Midwest Laboratories, 1994. Foliar Nutrition. Midwest Laboratories, Inc., Omaha, Nebraska. Qaseem, S.M., Afridi, M.M.R.K., Samiullah.,1978. Effect of leaf-applied phosphorus on the yield characteristics of ten barley varieties. Indian J. Agric. Sci. 48,215-217. Saskatchewan Ministry of Agriculture, 2012. Phosphorus fertilization in crop production. Tarkalson, David D., Brown, B., Kok, Hans, Bjorneberg, D.L., 2009. Irrigated small-grain residue management effects on soil chemical and physical properties and nutrient cycling. Soil Science 174, 303- 311. Thomason, W.E., Phillips, S.B., Warren, J.A., Alley, M.M., 2012. Winter hulless barley response to nitrogen rate and timing and foliar phosphorus. Journal of Plant Nutrition 35,225-234. Wysocki, D.J., Lutcher, D.A., Horneck, J.M., Petrie, S.E., 2005. Fertilizer guide: Winter wheat and spring grains in continuous cropping systems (low precipitation zone). FG 81-E. Oregon State University Cooperative Extension Service. Aown, M., Raza, S., Saleem, M.F., Anjum, S.A., Khaliq, T., Wahid, M.A., 2012. Foliar application of potassium under water deficit conditions improved the growth and yield of wheat (Triticum aestivum L.). Journal of Animal & Plant Sciences 22, 431-437. Crozier, C., Heiniger, R., Weisz, R., 2013. Nutrient management for small grains. In Weisz, R. (Ed.). Small Grain Production Guide. North Carolina State University. Fixen, P.E., Gelderman, R.H., Gerwing, J., Cholick, F.A., 1986. Response of spring wheat, barley and oats to chloride in potassium chloride fertilizers. Agronomy Journal 78, 664-668. Gardner, E.H., Jackson, T.L., Kronstad, W.E., 2000. Spring grains. Western Oregon: West of Cascades fertilizer guide. Oregon State University Extension Service. Jackson, G.D., Kushnak, G.D., Benson, A.N., Skogley, E.O., Lund, R.E., 1991. Potassium response in no- till small grain production. Journal of Fertilizer Issues 8, 89-92. Mullison, W.R., Mullison, E., 1942. Growth responses of barley seedlings in relation to potassium and sodium nutrition. Plant Physiology 17, 632-644. Saskatchewan Ministry of Agriculture, 2012. Potassium fertilization in crop production. Timm, C.A., Goos, R.J., Johnson, E., Sobolik, F.J., Stack, R.W., 1986. Effect of potassium fertilizers on malting barley infected with common root rot. Agronomy Journal 78, 197-200. Zheng, Y., Xianbin, X., Simmons, M., Zhang, C., Gao, F., Li, Z., 2010. Responses of physiological parameters, grain yield and grain quality to foliar applications of potassium nitrate in two contrasting winter wheat cultivars under salinity stress. Journal of Plant Nutrition and Soil Science 173, 444-452.